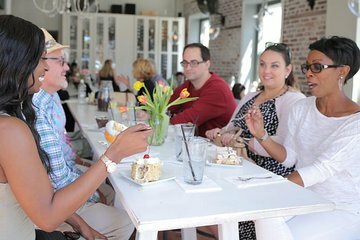 See the sweeter side of Charleston with a 2-hour dessert tour of the city’s most beloved local desserts. Hear about the South Carolina's culinary culture and heritage as you follow your experienced guide through a historic waterfront neighborhood that’s dotted with city landmarks. Enjoy a series of tastings that change with the season, but ranges from South Carolina’s sweet and sticky Huguenot Tart to classic pralines, zesty lemon bars and luscious coconut cake. Started off with Italian dessert not Southern. Had 3 full desserts in the second restaurant. So the 3,4,5, were overkill.